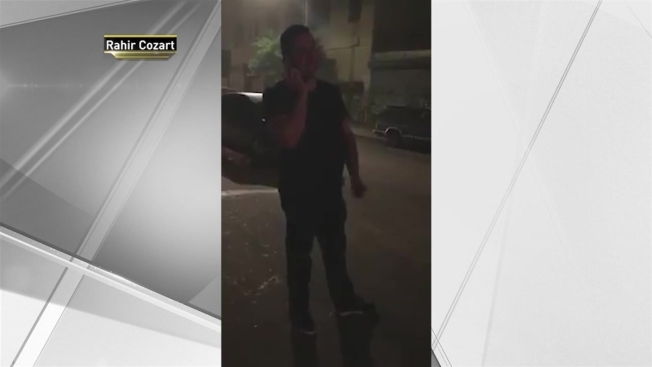 A man went on a tirade filled with racial slurs when he became angry at a bouncer outside a music venue in Brooklyn last weekend, and cellphone video capturing his rant quickly went viral and led to his firing, according to reports. The video, taken by witness Rahir Cozart, shows a white man, identified by The New York Post as 29-year-old real estate agent Chris Giardina, screaming at a black man near The House of Yes in Bushwick early Friday morning. Giardina, who appears to be intoxicated, claimed the bouncer hit him after he exited the wrong door while leaving the venue, according to The Post. Cozart asks Giardina, who appears to be calling police to claim he was assaulted by the bouncer, to repeat what he said before he started recording him. Giardina at first ignores Cozart and says on the phone, "Get a cop over here right now, or I'll end up burying this black guy." Aaron Schlossberg, the lawyer whose racial rant at a Manhattan restaurant went viral, sprints from NBC News cameras Thursday. Watch here. But when Cozart insists that Giardina answer him, Giardina finally turns to him and shouts, using a racial slur against Latinos, "Dude! S--c! Go away, s--c!" As the confrontation between Giardina and the bouncer gets increasingly heated, Giardina shouts the n-word, drawing gasps from the crowd gathered around them. Giardina continues to insist to police on the phone that the bouncer hit him in the face, which Cozart disputes in the video: "No, he didn't! You touched him! Self-defense, bro... I have the proof right here." Giardina repeatedly calls the bouncer "dumb f---" and "dirty f---ing black person." "I hate ignorant people. S--c ignorance, black ignorance," Giardina says, pointing at Cozart and the bouncer. "What is this, Harlem?" Giardina yells at the bouncer. "You'll lose your job, you'll lose your house. Trust me," he tells the bouncer. As bystanders become more agitated and angered by Giardina's slur-laden screams, Cozart is heard in the video attempting to keep them calm, reasoning that he had proof of Giardina's provocations on video: "We're stronger than this. Yo, we're better than this. We're better." The Post reports that Giardina, a Boston native, was fired by employer MySpace NYC over the video. Principal broker Shawn Mullahy told the newspaper, "I was very disappointed in the video to say the least. I was embarrassed and saddened by it. It's not in line with the company culture or values." Giardina told The Post he was embarrassed for using the word, but "it doesn't make me a racist, it makes me an idiot," claiming the word was "already in the air" and "was being thrown around the entire time." He said he didn't recall using the slur against Latinos. He added that the crowd outside the bar was "actually on my side" until he started using the slurs, and that the video was "manipulated" to make him look bad. The video posted on Cozart's Facebook page had over 100,000 views by Monday.